You are viewing the archived NBN Providers page. Follow the link to view the current NBN Providers rating page. 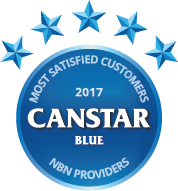 Canstar Blue’s annual review of NBN providers compares iiNet, TPG, Dodo, Optus and Telstra on speed performance, customer service, contract clarity, bill clarity, value for money and overall satisfaction. iiNet has taken over from parent company TPG at the top of Canstar Blue’s customer ratings for NBN providers, earning five star reviews in 2017 on speed performance, customer service, contract clarity, bill clarity and overall satisfaction. TPG, Dodo and Optus rated four stars overall, followed by Telstra on three stars. When the National Broadband Network (NBN) arrives in your area, your door will be opened to more than 130 different service providers. They include all the big names you’ve already heard of, as well as dozens of others you haven’t. Your challenge as a consumer is to find the provider and plan that best meets your new-found superfast internet needs. Our mission as a review and ratings website is to help you along the way. We do this by surveying hundreds of households across the country that are already switched over to the NBN. We ask them to rate their provider based on factors including contract clarity, bill clarity, speed performance and customer service. The feedback we receive is reflected by the star ratings table you see above. If you’re wondering why we haven’t rated 130 NBN service providers, it’s because we have strict minimum sample requirements to be included. If a small NBN provider only has 10 customers, we don’t include them. Our ratings have compared the biggest NBN providers, with iiNet emerging as the highest rated of the bunch in 2017, replacing parent company TPG at the top of the NBN standings. There may be more than 130 NBN providers in Australia, but a majority of households are connected with one of these big five telcos. Is that a good move? Maybe. We’ll come to that shortly. In addition to overall satisfaction, iiNet was the only NBN provider in this year’s review to score five stars for its customer service (an area in which the company has enjoyed a solid reputation over the years) and billing clarity. It was joined by TPG on five stars for contract clarity, and by Optus for speed performance. The only other five star rating this year was achieved by Dodo on value for money. Telstra was the only provider not to rate five stars in any area. Is your router ready for the NBN? How do the NBN speed tiers work? Recently acquired by TPG Telecom, it seems iiNet has lost none of the characteristics that made the Perth-based internet service provider such a hit with customers in the first place. In fact the telco has improved on its NBN ratings of 2016 when it received four stars for overall satisfaction and three stars on value for money. However, testament to its big selling point, iiNet still scored five stars on customer service last time out. This year, it earned top marks in every NBN category but value for money, rating four stars on this occasion. It’s certainly fair to say that iiNet is the not the cheapest NBN provider, focussing on a quality service rather than low prices. iiNet is very competitive and is clearly keeping a majority of its customers pretty happy. Plans are available on either a no contract or 24 month basis, with the flexible option resulting in a $79.95 activation fee. You can also throw in streaming service Fetch to any plan from an extra $10 a month. With NBN plans starting from just $29.90 a month, Dodo is one of the cheapest NBN providers out there. However, be sure to check the specific details of what you’ll be getting for your money as Dodo’s cheapest deals come with very modest data allowances and at the most basic speed tier on offer. If you want to bump up your data and speeds to the NBN max, it will set you back just short of $100. Choosing either a 12 month or no contract option will cost you a little extra in activation charges. Like iiNet, Dodo also provides access to streaming service Fetch at an extra cost. These costs can also increase if you add on extra call inclusions. Dodo certainly gives you the chance to connect to the NBN on the cheap, which seems to have gone down well as customers rated the telco five stars on value for money. In fact it rated well overall, with four stars in almost every other research category. Optus has a more concise range of NBN plans than you might expect from a big telco. You may also be surprised at its prices. You can get connected with Optus NBN from $60 a month, but if it’s entertainment packages you want, you’ll need to pay extra. The telco’s unique selling point is Optus Sport, which includes English Premier League soccer. Optus also offers access to Fetch, with prices starting at $80 a month. Plans are available monthly or over 24 months. The flexible option means you’ll need to pay a significant $200 upfront, but if you commit for the long haul, these charges are waived. All Optus NBN plans come with unlimited data. The simple approach from Optus seems to have gone down well as customers rated it four stars overall in this year’s ratings, an improvement on three stars overall last time out. They may be part of the same group, but there is some of a difference between TPG and iiNet. TPG plans start off at under $30, but you receive a very modest 10GB in return. Prices then increase gradually as you either increase your speed, data allowance or call inclusions. All plans are available with no lock-in contract, or over 18 months. However, the monthly option means you’ll need to pay a $99.95 set-up fee. TPG topped our NBN ratings in 2016 and this year scored four stars for overall satisfaction, in addition to bill clarity, contract clarity and value for money. It also rated three stars for speed performance and customer service. Like with Optus, the value in Telstra’s NBN plans comes in the form of its extra features. Telstra internet plans come with the option of adding a Foxtel subscription as well as Telstra TV, which allows access to streaming services like Netflix and Stan. Basic broadband packages are also on offer, with prices starting at $70 a month for 100GB of data over 24 months. Telstra offers unlimited data but be prepared to pay close to $100 a month. If you decide on a Telstra bundle, prices range from $70 up to $130, depending on data allowance, speed tier and entertainment packs. While Telstra does offer month-to-month plans, not all plans are available and extra set-up fees apply. Telstra was the only NBN provider in this year’s ratings to score just three stars overall. In fact it scored three stars in all research categories. Some of these NBN providers are subsidiaries of the bigger telcos mentioned already. Belong Broadband is owned by Telstra, while Internode and Westnet are owned by TPG Telecom and iPrimus is part of Vocus Communications, which also owns the Dodo brand. These smaller telcos tend to offer superior value than their bigger counterparts, but what you save in price you may lose when it comes to customer service. Big providers will generally have the most comprehensive customer service and will likely pick up the phone sooner if you call. This will not always be the case, but it’s worth keeping this in mind when deciding which provider to go with. Also consider that the big providers offer more in the way of extra entertainment features. While some of these NBN providers offer cheap alternatives to their much bigger counterparts, it will be hard to really judge their customer service credentials until you have actually signed up. That could mean taking something of a gamble with your NBN service. With that in mind, you might want to avoid lengthy contracts, rather keeping your options open in case things don’t work out as planned. As you will have gathered, picking the right NBN provider for your specific needs can be a real challenge, which will help explain why a majority of Aussie households stick with one of the big guys as a seemingly ‘safe bet’. While this is understandable, try to keep an open mind and judge each provider on its own merits. Try not to be sucked in by funny marketing campaigns or other gimmicks, rather focusing on the products being offered. Don’t be afraid to ask questions about customer service (such as call centre opening times) and what you will need to do in the event of any problems. Find out as much as you can about the provider itself and the plan on offer, by reading the critical information summary. This holds all of the details relating to the plan, including its contract terms and any charges you may need to pay. Also seek out customer reviews to give you an idea of what you can expect if you sign up. All in all, with so many providers out there it can be hard to disseminate which provider is right for you – there are thousands of plans on offer and you may have to do some digging before you find the right one. How much can you expect to pay on the NBN? Our research shows that households connected to the NBN are paying an average of just over $78 a month for their new service. This compares to an average of about $70 for those who have an ADSL connection, suggesting an upgrade to the NBN is resulting in higher costs for many. But it doesn’t have to be the case. While the opportunity to upgrade your service is tempting, be sure to consider exactly what you need in terms of speed levels and data allowance. Many providers only offer unlimited data, but this could mean you are paying for something you don’t need. Switching to the NBN will not necessarily represent an upgrade to your home internet service in terms of performance, especially if you subscribe to a plan with the slowest download speeds, which are comparable to those experienced with an ADSL2+ connection. Two-thirds of respondents to our survey (65%) describe their NBN service as superior to their old one. NBN speeds remain a major political issue, with the Australian Competition and Consumer Commission (ACCC) investigating service providers to ensure that advertised speeds are actually being met by the end user. It is always worth remembering that all download/upload speeds reported are the maximum speeds that can be achieved with a particular plan. While it’s tempting to go for a cheap NBN plan, keep in mind that doing so will likely mean you are sacrificing either speed or data allowance. You might find there is better value in paying a little extra, but think carefully about what you’re getting if your new NBN plan starts to become more expensive than your old service. The last thing you’ll want is to end up paying more for a service that is no better than your old one! When it comes to picking an NBN provider or plan, the most important message is to keep your options open – you certainly have plenty of them! Canstar Blue commissioned Colmar Brunton to survey 6,000 Australian adults across a range of categories to measure and track customer satisfaction. The outcomes reported are the results from customers within the survey group who have an NBN internet account in their name and they pay the bills – in this case, 892 people.